MELVILLE, NEW YORK, May 23, 2006 - FONAR Corporation (NASDAQ-FONR), The Inventor of MR Scanning™, announced today the success being achieved by East Brunswick Open Upright MRI. One of the center’s founders and partners is Peter C. Schultz, Ph.D., best known for being the co-inventor of the optical fiber. The center commenced operation in January 2006 and since then its patient volume has risen rapidly. 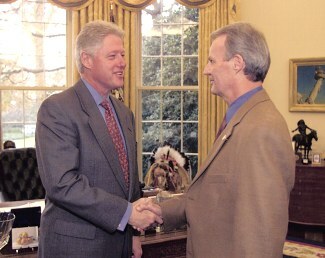 President William Clinton congratulates Peter C. Schultz, Ph.D., upon receiving the National Medal of Technology, February 2000. “Our group selected the site for the installation of our FONAR Upright™ MRI in the busy medical community of East Brunswick, New Jersey, and we became operational this past January. Our patient throughput rate measured by the number of scans per month has met and exceeded our expectations because the local medical community has been very receptive toward this new technology. Currently, we are at the breakeven level,” said Dr. Schultz. “The capabilities of the FONAR Upright™ MRI are enhanced when scans are transferred digitally over fiber optic cables from our center to our referring physicians for their review,” continued Dr. Schultz. “They are also sent to FONAR’s headquarters where they are monitored in real-time for scanner performance. It is gratifying to know that my invention of fiber optics is contributing toward the advancement of medical imaging technology." “Another connection I have with the MRI industry is that I, too, have had the need for several MRI scans over the last few years. These were taken in ‘open’ machines where the top of the magnet was just inches from my face, and in the high-field ‘tube’ machines which are extraordinarily confining. Since then I have been in the very patient-friendly FONAR Upright™ MRI. To me it’s a miracle that such a wonderful machine can be so comfortable and at the same time be so medically effective. Patient comfort is just one of the major benefits of FONAR’s Upright™ MRI," said Dr. Schultz. “In the short time that East Brunswick Open Upright MRI has been operational, we have seen numerous cases where a patient’s problem is missed when scanned laying down in a recumbent scanner. We can unequivocally proclaim that using our FONAR Upright™ MRI allows us to find the problems experienced by patients that can’t be seen in other types of MRIs. Furthermore, our referring physicians are thrilled that they have access to such a patient-friendly device that also can produce images where pathology is clearly evident. This has been why our success rate has come so quickly,” concluded Dr. Schultz. East Brunswick Open Upright MRI is located at 620 Cranbury Road in East Brunswick, New Jersey. Their telephone number is (732) 698-1717. For a streaming video presentation of the center’s January Grand Opening featuring Dr.Schultz and Dr. Damadian, please go to www.mctv77.org, select: 'Video Library 1', and then select the picture of 'The Stand-Up MRI'. industry. FONAR introduced the world's first commercial MRI in 1980, and went public in 1981. Since its inception, FONAR has installed hundreds of MRI scanners worldwide. Their stellar product line includes the FONAR UPRIGHT™ MRI (also known as the Stand-Up™ MRI), the only whole-body MRI that performs Position™ imaging (pMRI) and scans patients in numerous weight-bearing positions, i.e. standing, sitting, in flexion and extension, as well as the conventional lie-down position. The FONAR UPRIGHT™ MRI often sees the patient's problem that other scanners cannot because they are lie-down only. With nearly one half million patients scanned, the patient-friendly FONAR UPRIGHT™ MRI has a near zero claustrophobic rejection rate by patients. A radiologist said, "FONAR UPRIGHT™ MRI - No More Claustrophobia - The Tunnel Is Gone." As another FONAR customer states, "If the patient is claustrophobic in this scanner, they'll be claustrophobic in my parking lot." Approximately 85% of patients are scanned sitting while they watch a 42" flat screen TV. FONAR's latest MRI scanner is the FONAR 360, a room-size recumbent scanner that optimizes openness while facilitating physician access to the patient. FONAR is headquartered on Long Island, New York, and has approximately 400 employees.